MailPoet subscription add-on for WP User Frontend Pro allow you to add new user to your mailpoet subscriber list automatically. This add-on is based on MailPoet (Wysija) plugin. Navigate to your WP dashboard->User Frontend->Modules. Find MailPoet and turn on the toggle button on the top right to activate this module. On creating a new registration form there is simple three steps to done with WPUF MailPoet add-on. Make the “Enable MailPoet” checkbox on. 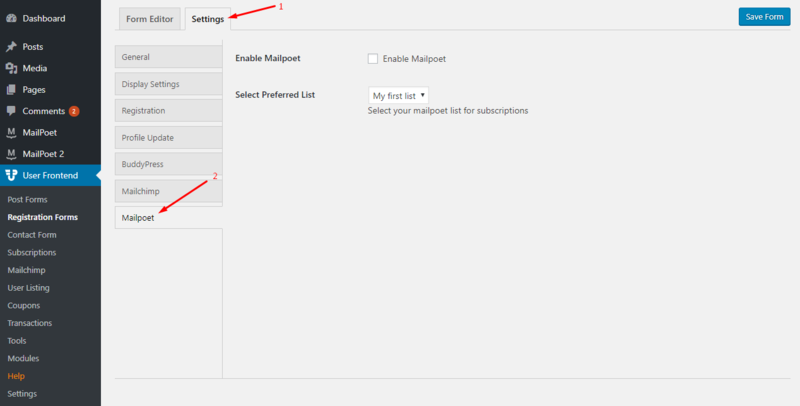 Select your MailPoet subscriber list from the select box.